I’m an au pair here in New Zealand since end of October and I will stay till the end of april. My host family is living on a farm in Te Awamutu which is about 45 minutes from Hamilton. I am looking after three children: Briana is 4, Malachi is 2 and Levi is 7 months old. My day with them starts in the mornings preparing breakfast and getting Briana ready for preschool. While Briana is in preschool, I look after the two boys and do some household. When I was told that my host family is living on a farm, I first was a little bit worried that I could feel alone. But it is actually really nice living here! As my host parents work in the same place as they are living, they come home quiet often. So I usually don’t have the kids for a long time on my own. That helped me a lot to feel quiet fast at home because I can also spend more time with my host parents and I don’t feel like a nanny, but like a part of the family. Another thing about living on a farm is that you can do lots outside with the kids. We have so much space here, we play together on their playground, go on a walk on the farm, draw with chalks and so on. And I already met a lot of people here. Sure, you can not meet your neighbors as easily as in a city and there are not as many au pairs. 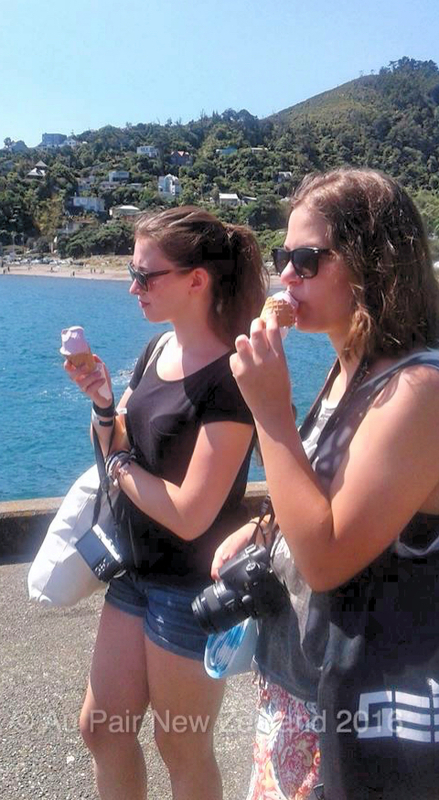 But there are lots of backpackers and au pairs everywhere in New Zealand and most people are open-minded, so you just have to go on a trip to meet new people.